Kansas, 1959. A travelling carnival appears overnight in the small town of Seneca Falls, intriguing the townsfolk with acts of inexplicable magic and illusion. But when a man’s body is discovered beneath the carousel, with no clue as to his identity, FBI Special Agent Michal Travis is sent to investigate. Led by the elusive Edgar Doyle, the carnival folk range from the enigmatic to the bizarre, but none of them will give Travis a straight answer to his questions. With each new turn of the investigation, Doyle and his companions challenge Travis’s once unshakeable faith in solid facts and hard evidence. As the consequences of what has happened become ever more disturbing, Travis struggles to open his mind to a truth that defies comprehension. Will he be able to convince himself that things are not what they seem? Or will he finally reconcile himself to a new reality – one that threatens to undermine everything in which he has ever placed his trust? 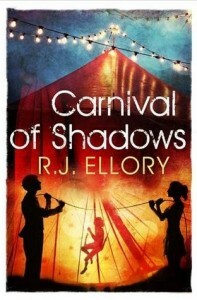 In his powerful, atmospheric new thriller, bestselling author R.J. Ellory introduces the weird and wonderful world of the Carnival Diablo and reveals the dark secrets that lurk at its heart.